Chaos - in one ancient Greek myth of creation, the dark, silent abyss from which all things came into existence. According to the Theogony of Hesiod, Chaos generated the solid mass of Earth, from which arose the starry, cloud-filled Heaven. Mother Earth and Father Heaven, personified respectively as Gaea and her offspring Uranus, were the parents of the Titans. In a later theory, Chaos is the formless matter from which the cosmos, or harmonious order, was created. Gaea - She was the mother and wife of Father Heaven, Uranus. They were the parents of the first creatures, the Titans, the Cyclopes, and the Giants - the Hecatoncheires (Hundred - Headed Ones). Uranus hated the monsters, and, even though they were his children, locked them in a secret place in the earth. Gaea was enraged at this favoritism and persuaded their son Cronos to overthrow his father. He emasculated Uranus, and from his blood Gaea brought forth the Giants, and the three avenging goddesses the Erinyes. Her last and most terrifying offspring was Typhon, a 100-headed monster, who, although conquered by the god Zeus, was believed to spew forth the molten lava flows of Mount Etna. Tartarus - The lowest region of the underworld. Hesiod claimed that a brazen anvil would take none days and nights to fall from heaven to earth, and nine days and nights to fall from earth to Tartarus. Tartarus rose out of Chaos and was the destination of wicked souls. Uranus banished his children the Cyclopes and the Hecatoncheires to Tartarus, as Zeus also did to the Titans. Other famous inhabitants of Tartarus include Sisyphus, Ixion, Tantalus, Salmoneus, Tityus, Ophion, and the daughters of Danaus. Eros - The god of love. He was thought of as a handsome and intense young man, attended by Pothos ("longing") or Himeros ("desire"). Later mythology made him the constant attendant of his mother, Aphrodite, goddess of love. Erebus - Personification of the darkness of the Underworld and the offspring of Chaos. . In later myth, Erebus was the dark region beneath the earth through which the shades must pass to the realm of Hades below. He is often used metaphorically for Hades itself. Uranus - Gaea - The personification of the sky; the god of the heavens and husband of Gaea, the goddess of the earth. . Their children are the Hecatonchires, the Cyclopes and the Titans. Cyclopes - Three sons: Arges, Brontes, and Steropes of Uranus and Gaea. The Cyclops were giant beings with a single, round eye in the middle of their foreheads.They helped Zeus defeat their brother, Cronus, by forging lightning bolts. They also made Poseidon's trident and Hades invisibility cap. Hecatonchires - Three sons of Uranus and Gaia. There were three of them: Briareus also called Aegaeon, Cottus, and Gyges also called Gyes. They were gigantic and had fifty heads and one hundred arms each of great strength. They had 100 hands and helped Zeus in his war against the Titans. Cronus - Rhea - Cronus was a ruler of the universe during the Golden Age. He was one of the 12 Titans and the youngest son of Uranus and Gaea, Cronus and his sister-queen, Rhea, became the parents of 6 of the 12 gods and goddesses known as the Olympians. Cronus had been warned that he would be overthrown by one of his own children. To prevent this, he swallowed his first five children as soon as they were born. Rhea did not like this. She substituted a stone wrapped in swaddling clothes for their sixth child, Zeus. He was hidden in Crete, and when he was older, he returned and forced Cronos to disgorge all the other children, who had grown inside of him. Zeus and his siblings fought a war against Cronos and the Titans. Zeus won, and the Titans were confined in Tartarus, a cave in the deepest part of the underworld. Coeus - Phoebe - Coeus was a titan of Intelligence, the father of Leto, husband of Phoebe. Oceanus - Tethys - The personification of the vast ocean. Together with his wife Tethys, they produced the rivers and six thousand offsprings called the Oceanids. He ruled over Ocean, a great river encircling the earth, which was believed to be a flat circle. The nymphs of this great river, the Oceanids, were their daughters, and the gods of all the streams on earth were their sons. Hades - He was made lord of the underworld, ruling over the dead. He is a greedy god who is greatly concerned with increasing his subjects. Those whose calling increase the number of dead were seen favorably by him. He was also the god of wealth, due to the precious metals mined from the earth. His wife was Persephone whom Hades abducted. The underworld itself was often called Hades. It was divided into two regions: Erebus, where the dead pass as soon as they die, and Tartarus, the deeper region, where the Titans had been imprisoned. It was a dim and unhappy place, inhabited by vague forms and shadows and guarded by Cerberus, the three-headed, dragon-tailed dog. Sinister rivers separated the underworld from the world above, and the aged boatman Charon ferried the souls of the dead across these waters. Poseidon - God of the sea. His weapon was a trident, which could shake the earth, and shatter any object. He was second only to Zeus in power amongst the gods. Under the ocean, he had a marvelous golden palace. Poseidon was the husband of Amphitrite, one of the Nereids, by whom he had a son, Triton. Poseidon had numerous other love affairs. At one point he desired Demeter. To put him off Demeter asked him to make the most beautiful animal that the world had ever seen. To impress her Poseidon created the first horse. In some accounts his first attempts were unsucessful and created a varity of other animals in his quest. By the time the horse was created his passion for Demeter had cooled. Zeus - Hera - The god of the sky and ruler of the gods of Mount Olympus. He displaced his father and assumed the leadership of the gods of Olympus. 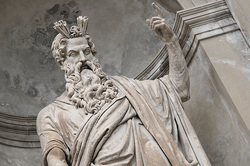 Zeus was considered the father of the gods and of mortals. He did not create either gods or mortals; he was their father in the sense of being the protector and ruler both of the Olympian family and of the human race. His weapon was a thunderbolt. His breastplate was the aegis, his bird the eagle, his tree the oak. He was married to Hera but, is famous for his many affairs, which resulted in many known children and probably many more that were not known to be his. Athena was his favorite child. He bore her alone from his head. One of the greatest feasts for Zeus was the Olympic games. They were taking place every four years in Olympia. Even if there was a war between the city-states of Greece they were stopping the war to take part on that games. Hera's marriage was founded in strife with Zeus and continued in strife. Writers represented Hera as constantly being jealous of Zeus's various amorous affairs. She punished her rivals and their children, among both goddesses and mortals, with implacable fury. The peacock (the symbol of pride; her wagon was pulled by peacocks) and the cow (she was also known as Bopis, meaning "cow-eyed", which was later translated as "with big eyes") were her sacred animals. Her favorite city was Argos. Demeter - Zeus - Goddess of corn and the harvest. She taught mankind the art of sowing and ploughing so they could end their nomadic existence. She was of a severe, a beauty scarcely relieved by her hair. which was as fair as ripened grain. Poseidon coveted her, but Demeter refused herself to him. To escape him she fled to Arkadia where, assuming the shape of a mare, she mingled with the herds of King Oncus. Poseidon, however, succeeded in finding her, changed himself into a stallion and made her the mother of the horse Arion. When her daughter Persephone was abducted by Hades, god of the underworld, Demeter's grief was so great that she neglected the land; no plants grew, and famine devastated the earth. Dismayed at this situation, Zeus, demanded that his brother Hades return Persephone to her mother. Hades agreed, but before he released the girl, he made her eat some pomegranate seeds that would force her to return to him for four months each year. In her joy at being reunited with her daughter, Demeter caused the earth to bring forth bright spring flowers and abundant fruit and grain for the harvest. However, her sorrow returned each autumn when Persephone had to return to the underworld. The desolation of the winter season and the death of vegetation were regarded as the yearly manifestation of Demeter's grief when her daughter was taken from her. Demeter and Persephone were worshipped in the rites of the Eleusinian Mysteries. Persephone - Persephone was the Queen of the Underworld and the daughter of Demeter. Persephone is the goddess of the underworld in Greek mythology. She is the daughter of Zeus and Demeter, goddess of the harvest. Persephone was such a beautiful girl that everyone loved her, even Hades wanted her for himself. Although Zeus gave his consent, Demeter was unwilling. Hades, therefore, seized the maiden as she was gathering flowers and carried her off to his realm. Persephone was a personification of the revival of nature in spring. Her attributes in iconography can include a torch, a crown, a sceptre, and stalks of grain. Leto - Zeus - The mother of Artemis, goddess of the bow and of hunting. She was loved by the god Zeus, who, fearing the jealousy of his wife, Hera, banished Leto when she was about to bear his child. All countries and islands were also afraid of Hera's wrath and refused the desperate Leto a home where her child could be born. Finally, in her wanderings, she set foot on a small island floating in the Aegean Sea, which was called Delos. Athena - or Pallas-Athene, is one of the most important goddesses in Greek mythology. Goddess of wisdom, war, the arts, industry, justice and skill. Athena sprang full-grown and armoured from the forehead of the god Zeus and was his favourite child. She was fierce and brave in battle but, only fights to protect the state and home from outside enemies. She was the goddess of the city, handicrafts, and agriculture. She invented the bridle, which permitted man to tame horses, the trumpet, the flute, the pot, the rake, the plow, the yoke, the ship, and the chariot. Her attributes in iconography include the aegis (a fringed cloak, sometimes decorated with a Gorgon's head), the helmet, and the spear. Ares - God of war. He was very aggressive. He was unpopular with both gods and humans. Ares was not invincible, even against mortals. He personified the brutal nature of war. He was immortal but whenever he would get hurt he would run back to his father, Zeus and was healed. Ares was mainly worshipped in Thracia. Hebe - The goddess of youth. She, along with Ganymede were the cupbearers to the gods, serving them their nectar and ambrosia. She also prepared Ares' bath, and helped Hera to her chariot. Hebe was Hercules' wife. Hephaestus - God of fire and metalwork. He was born lame and weak, and shortly after his birth, he was cast out of Olympus. In most legends, however, he was soon honoured again on Olympus and was married to Aphrodite, goddess of love, or to Aglaia, one of the three Graces. His workshop was believed to lie under Mount Etna, a volcano in Sicily. He made many wonderful artifacts for the gods, including the twelve golden thrones of the Olympians, their weapons and treasures. Apollo - Apollo was primarily a god of prophecy. He sometimes gave the gift of prophecy to mortals whom he loved, such as the Trojan princess Cassandra. As a prophet and magician, he is the patron of medicine and healing. He was a gifted musician, who delighted the gods with his performance on the lyre. He was also a master archer and a fleet-footed athlete, credited with having been the first victor in the Olympic games. His twin sister was Artemis. He was famous for his oracle at Delphi. People traveled to it from all over the Greek world to divine the future. He was also the god of agriculture and cattle, and of light and truth. Artemis - Artemis was the goddess of the hunt and animals, as well as of childbirth. Her twin brother was Apollo. As the moon goddess, she was sometimes identified with the goddesses Selene and Hecate.Her attributes are the bow and arrow, while dogs, deer and goose are her sacred animals. Her most elaborate temple was in Ephesis. Atlas - Son of the Titan Iapetus and the nymph Clymene, and brother of Prometheus. Atlas fought with the Titans in the war against the deities of Mount Olympus. Atlas stormed the heavens and Zeus punished him for this deed by condemning him to forever bear the earth and the heavens upon his shoulders. He was the father of the Hesperides, the nymphs who guarded the tree of golden apples, and Heracles (Hercules). Prometheus - Prometheus was the wisest Titan, known as the friend and benefactor of humanity.He stole the sacred fire from Zeus and the gods. He also tricked the gods so that they should get the worst parts of any animal sacrificed to them, and human beings the best. Zeus commanded that Prometheus be chained for eternity in the Caucasus. There, an eagle would eat at his liver and each day, the liver would be renewed. So the punishment was endless, until Heracles finally killed the bird. Epimetheus - Epimetheus was a Titan, whose name meant "afterthought". In some accounts, he was delegated, along with his brother Prometheus by Zeus to create mankind. He foolishly ignored his brother Prometheus' warnings to beware of any gifts from Zeus. He accepted Pandora as his wife, thereby bringing ills and sorrows to the world. Maia - Zeus - Maia was a daughter of Atlas. She was one of Zeus' lovers. She, along with Zeus was the mother of Hermes. Dione - Zeus - The goddess or Titaness Dione became by Zeus the mother of Aphrodite. Hermes - Hermes' main role was as a messenger. As the special servant and courier of Zeus, Hermes had winged sandals and a winged hat and bore a golden caduceus, or magic wand, entwined with snakes and surmounted by wings. He conducted the souls of the dead to the underworld and was believed to possess magical powers over sleep and dreams. Five minutes after he was born, he stole a herd of cows from Apollo. He invented the lyre from a cow's internal fibers. After Apollo learned what happened, he knew that his half-brother should he one of the pantheon. Hermes was the patron of trickster and thieves because of his actions early in life. His attributes in iconography include the kerykeion (messenger's staff), winged boots, and petassos (cap). Aphrodite - The goddess of love and beauty. Aphrodite loved and was loved by many gods and mortals. Among her mortal lovers, the most famous was perhaps Adonis. Some of her sons are Eros, Anteros, Hymenaios and Aeneas (with her Trojan lover Anchises). Perhaps the most famous legend about Aphrodite concerns the cause of the Trojan War. She was the wife of Hephaestus. The myrtle was her tree. The dove, the swan, and the sparrow were her birds.